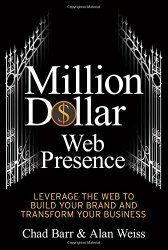 This book is a complete guide to online marketing and all the things you need to consider if you are to approach that elusive $1m. It is a book that does live up to its extravagant claims because, I know for a fact, that at least one of the authors is a multi-millionaire. That is Alan Weiss, and his advice about business is down-to-earth and practical. So too is this book. Indeed, “Million Dollar Web Presence” complains that too many websites are full of surprises around every corner, offering far too much. Then, the book goes on to say that optimising a web page for Google is taking your eye-off-the-ball of providing something for human buyers of your products and services. In fact, this book destroys several myths about online marketing. However, it does more than that. The book gives you practical advice on what you do need to do so that you can generate income. A key feature that arises from this book is the need to focus, have a strategy and then to use all the tools available to promote that. Notice too, that the title includes the words “web presence”, so it is not just about websites, but also considers newsletters, blogs, email marketing, and social media. So, as such, it is a complete manual for your online business.